History has often ignored the time Frank James spent in what is now the state of Oklahoma. From the time of the Civil War to the years before his death Frank had ties to the Sooner State. Born Alexander Franklin James on January 10, 1843 he was nicknamed "Buck" by family and friends. We simply know him as Frank. He first traveled into the Indian Territories while riding with Quantrill's Raiders. At the close of the Civil War the James/YoungerGang was formed. Little is known about the time Frank spent in Oklahoma during his outlaw years, but it must have been a favorite haunt due to the many stories that persist to this day. There were even rumors that Frank caught and sold wild horses from the Wichita Mountain Range during the years before 1900. 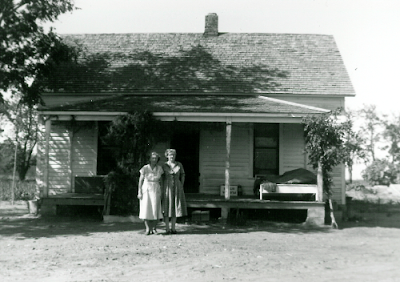 What is known and can be verified is that Frank and his wife Annie came to Oklahoma in 1905 looking to settle in the Fletcher area. The local paper reported on Dec. 16, 1905 that Frank had purchased a farm north of town. In November of 1907 Frank settled on his farm and began building his house in December of that year. Mr. and Mrs. E.W. Dilling soon became good friends of Frank and Annie. Mr. Dilling was the president of the Fletcher bank. It was Mrs. Dilling who recalled that Frank brought in a large roll of dirty bills that were presumed to have been dug up and opened a bank account with them. Locals knew that Frank spent time searching for the treasures he had long ago hidden. He was known to have recovered $6000 near Cement, Ok. and there were rumors of many more he unearthed. On Feb. 17, 1911 the Fletcher Times reported the death of the mother of Frank and Jesse James. Mrs. Zerelda Samuels passed away while en-route back to Missouri after a visit with Frank. She passed away on a Frisco train before reaching Oklahoma City. It was shortly after this that Frank left Oklahoma and moved back to the family farm in Missouri. There were a number of Frank James imposters before and after his death. To this day there are those who would have you believe that the man living outside of Fletcher was a double who took Frank's place, so that the real Frank James could live in peace under an assumed name. These stories are told without facts that can be verified. There is more than enough proof that the real Frank James was the man who lived on the Caddo County line and left his mark in Oklahoma history. Here are a couple of more tales for those of you in Oklahoma. As before, some of these may be redundant as Steve Wilson covered many in his book but the information I am using is coming from sources other than his book. South of Oklahoma City about five miles is a creek called Lost Creek. For those of you that try looking for this one the creek is really lost as only the local residents know it as Lost Creek. The creek is located just to the east of a main road and the land this treasure sits on is privately owned. The treasure originated from a pack train of 40 mules being led by a group of Mexicans. The mules were loaded with gold bars and as almost every story of the time goes, the group was attacked by Indians. The attack occurred while the group was at a spring along the trail they were following. In an effort to hide the gold before making a hasty retreat the Mexicans dumped the gold bars into a deep pool formed by the spring. Unfortunately most of the Mexicans didn’t make it any farther than the gold did and it is said that the bodies of both man and mule littered the creek bottom where the attack occurred. The spring where the gold bars were dumped is today located in an area that would be the east branch of Lost Creek. I can tell you that at one time there was an old barn that was on the property that had either fallen down or been torn down and a previous land owner had used the spot near the creek, probably where the pool was, as a dumping ground for all things metal. Be prepared for some pretty serious metal detector hits, maybe a one really good one and a bunch of junk ones. The landowner 25 years ago was a nice enough fellow and didn’t have any problem with people looking around. In the east part of Ellis County, Oklahoma is the rumor of a large Spanish treasure that was left behind during a, you guessed it, Indian attack. There was supposed to be a large Spanish caravan with several mules carrying that precious yellow metal we all want to find. The caravan was attacked somewhere near Vici, OK in a narrow canyon. It is unclear if the Spanish had time to actually hide this treasure before being killed or if the Indians hid the treasure after they massacred the Spaniards. Legend has it that all of the Spaniards were killed so this treasure story probably originated from one of the Indians that was at the attack or one of their ancestors. There was a group of settlers during 1900 that found a bunch of exposed human bones in a long narrow canyon near some sand dunes. These bones were found in an area near Vici. Later, in 1912 after a hard rain, several old Spanish coins were found in an area just west of Vici, Oklahoma. These two incidences are probably connected. By now, most of you know the basics of how to interpret carvings and how to look for terrain features that may fit some of the symbols. What I am going to try to do in several articles is to take carved symbols I have run across and break them down to how they worked at a particular site. This is not so much a definition of a particular symbol but more of an explanation on how the symbol worked so that you can make your own interpretations of symbols as you find them. As I show different carved symbols I will say what type of carving they are such as outlaw or Spanish or maybe even the illusive KGC symbol. I will tell you that I mostly hunt for outlaw and Spanish treasure and I consider 85-90% of the signs used by the KGC to fall under the same umbrella as outlaw symbols. There are a few specific symbols the KGC were known to use to denote a site as theirs and I might discuss those sometime in the future. You should keep in mind that even though I identify something as outlaw or Spanish that doesn’t mean the sign can’t mean the same thing for both groups or even something different but was used by more than one group. 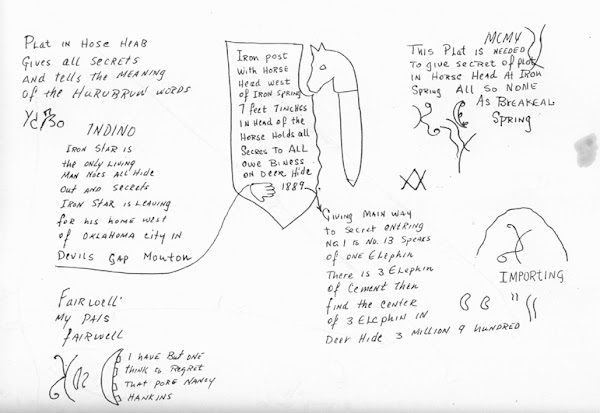 Some of the information learned about signs/symbols came from different groups and times and seems to have carried over from one group to another on occasion. The carving I have posted a photo of with this article is outlaw in nature and is just one symbol of several in a carved map. I am only discussing the one symbol and for ease of pointing out, I have cropped out the rest of the map. You bought that reasoning, didn’t you? When looked at in context with the rest of the map this symbol appears as a small letter “b”. There can be several interpretations of this symbol such as a trail or valley that leads you to a box canyon or follow a line/trail to a spot where you can take a second trail around or a hole or cave in the side of a tunnel or it could even actually be the letter “b”, just to mention a few. In the case of the map this letter was carved in, it was not used as a letter. This symbol was meant to tell you to “take a line across the base of the hill”. I have laid the photo on its side to better illustrate this interpretation. At the point along the trail where the “b” comes into play there was a large rock, the shape of this rock was carved in the map and this rock had a straight line carved in it to give a specific direction. This rock was at the base of a hill. I know, a lot of you are saying; wait a minute; the letter wasn’t carved on its side. That is correct but in carved maps the symbol does not always have to be oriented the way it is to be looked at. To further explain and maybe confuse you a little, this particular carved map was made so that every other symbol was an object that you would find such as another carving, a large rock, etc. The other symbols in the map were instructional. So, you had a symbol that told you what to do and then a symbol that would show you what you would find when you followed the first symbol. This continued throughout a specific portion of the map. Another interesting thing about this map was that the symbols that told you what to do alternated on how to read them. They were carved so that you would read everything from left to right but also each of the instructional symbols was made to read from top to bottom and then bottom to top alternately. So you weren’t only using every other symbol for instructions, you were switching how you interpreted the symbols from reading top to bottom on one and then bottom to top on the next and then back to top to bottom on the next. I have only run into one map that has been this organized, or confusing depending on how you look at it, but because this one is out there I would be willing to bet there are others. This mapmaker was a genius. In my opinion he was an evil genius but a genius nonetheless. The simplest and probably most annoying answer to this question is, sometimes. When you are dealing with carved maps there are several different tricks the mapmakers used to hide the information in the map. This is true for just about any mapmaker whether it was an outlaw, a Spaniard, a pirate, etc. One of the most common tricks was to make the entire map so it has to be read in mirror image or so that one or more parts of the map are in mirror image/reversed. There are times when trying to interpret a map that figuring out which parts, if any, need to be looked at in mirror image is the hardest part of the map interpretation. People will tell you that there will be a symbol that says the map or a certain portion of it should be looked at in mirror image but this isn’t always so. I have found that more often than not, there isn’t any symbol or sign that indicates the map should be mirror imaged. This leaves it to us, the intrepid treasure hunter, to figure it out on our own. I have found two simple things to look at when first encountering a carving that will hint to whether the map or part of it needs to be looked at in mirror image. The first and most obvious thing to look for is the “hole” symbol. It has been my experience that most carved maps will have a symbol that indicates the hole. This can be a square or regular U, a drill hole or dot, a carved circle, a circle with a dot, etc. The indicators for the hole can be several things but in general, the hole symbol should be the last symbol on the map. If you look at the map and see that the hole symbol is the first symbol then it would stand to reason that the map needs to be reversed or mirror imaged so that the hole symbol is the last symbol on the map, reading from let to right. The hole is, after all, what you want to find and there has to be symbols that lead you to it. I will say at this point that you should keep in mind that a drill hole can be used for more than one thing and doesn’t always indicate the hole so you can have drill holes anywhere in a map. The second indicator that one or more parts of the map may need to be looked at in reverse or mirror image is if the map is broken up into obvious parts. By this I mean “lines” of code, as if there were separate sentences or the parts can be broken up into sections where it is obvious that several symbols are a group and there is more than one group but they are all close enough together to be one map. You can also have a section of a map distinguished by another by having it surrounded by a circle or a box or even a triangle. Anything that appears to separate part of the code from the rest can indicate “separate” sections of the map and anytime there are separate sections to a map I would say you have a better than 50/50 chance that at least one section or part of the map will need to be reversed or mirror imaged. The easiest thing about mirror imaging or reversing a carving is a computer. Although computers can make us reliant on technology and therefore a little stupid at times compared to the mapmakers of long ago, they do make reversing an image as easy as loading it into a photo program and making a few clicks on the mouse. I can’t say it enough, get a good digital camera and take photos, lots of photos! A good camera is as important as a good metal detector. And now to confuse you a little. I have run into two maps so far that have “garbage” in them. These two maps had the hole symbol about two-thirds of the way through the maps and the hole symbol was disguised. In both cases they used drill holes to indicate the hole but earlier in the maps they had used drill holes to indicate other things also. This was done so that you would pass by the hole and continue trying to work the last third of the map, which takes you nowhere. It was basically garbage added at the end of the map to take you past the hole and confuse the crap out of you. And it worked, for a VERY long time! The remedy for this is looking at the carving very carefully and having a lot of patience and persistence. You’re probably still going to go past the hole a few times but you will eventually see your mistake and know to ignore that portion of the map. You should always keep in mind that there are very few absolutes in treasure hunting. It is very rare that one site will work exactly like another site, especially outlaw sites. By posting the information that we are, Okie and I are trying to give you some ideas and to get your brains wrapped around some of the tricks that were used. This way you can formulate your own ideas when in the field based on your own particular circumstances. Ever since Steve Wilson published this map on page 144 of his book, Oklahoma Treasures and Treasure Tales, people have debated as to where the true location of this map is. I will give you enough clues as to figure this out for yourself. The red line represents the old trail that was used for years and is a road today. 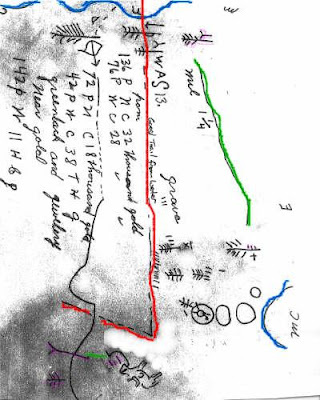 There is still a road that crosses between the two mountains as shown on Wilson's map. Please ignore the #13 drawn on the map along side of the red line. I have loaned out my copy of the book and had to use a copy of the map that had been sent to me. I overlooked the number when I was cleaning it up to use here and it's not original to the map. 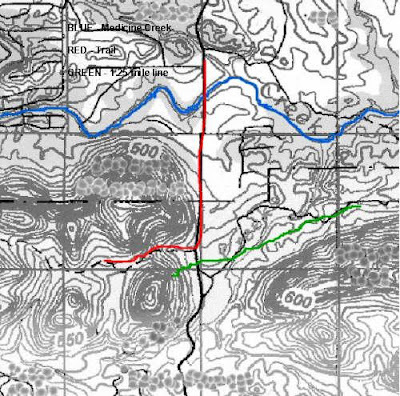 The long green line on Wilson's map is giving you the distance from the mountain to to the horse and saddle. It's 1.25 miles. Look at the bottom of the green line and you will see a tree with three lines coming out of the trunk. Now look at the area to the upper left of the horses head. Do you see those same three marks? Now follow the small green line to the left of the horse. Notice the tree and a long leg Y looking symbol on the mountain. These same symbols can be found at the top of long green line on the same map. Years ago there was a spoon with three drill holes in it found on this mountain that the long leg Y symbol is on. I have included a picture of these mountains looking from the east to the west just as you would when working this map. Unfortunately most of the area this map covers is on federal property and off limits to treasure hunters. I'm fairly sure Frank James recovered this one as his name was carved into the log of a miners cabin very near the site. He was also known to have spent some time in the area searching for this and others caches the gang had made. 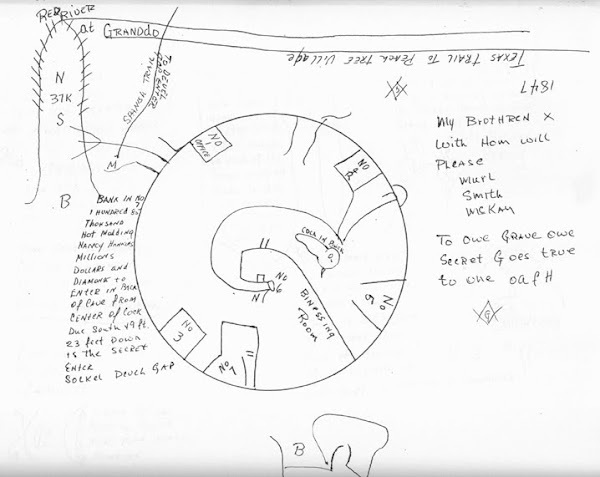 Wells Blevins had another version of this map that was drawn onto his table cloth by an old outlaw. He is pictured holding it in Wilson's book. The map was for sale a couple of years ago. I have now given you enough information to figure out where this map went to. Log onto google earth and take a look for yourself and see if the map fits my explaination. You can find the link here on the blog. I could have included more detail, but I think it's more fun if you do the research on your own. Mississippi had it’s own famous gang of outlaws known as the James Copeland Gang. This gang of outlaws carried out robberies all along the coastal states from Florida to Texas. Before fleeing to Alabama after one of these robberies the gang stopped in New Orleans to pick up three whiskey barrels. They then proceeded to fill the barrels with gold coins and put them on a boat where they took them to Pearlington, MS. At this point they transported them to a spot along the Catahoula Creek where they promptly buried them for safe keeping. It is thought they buried the barrels one to two miles from the home Gale H. Wages who was one of the gang members. It is said that James Copeland and his gang had many caches that they hid in Mississippi, some in barrels, others in copper or brass pots. To add a little fuel to the fire, there was a story floating around in the 1980’s that a group of treasure hunters unearthed a whiskey barrel in a swampy area near Pascagoula, MS. and it’s contents was $22,000.00 in gold coins. Pascagoula and Pearlington are pretty far apart so it would seem that this barrel would have to be from another cache. It seems the stories about robberies committed by the Copeland Gang in Mississippi are almost as prevalent as the stories about Jesse James and his gang. And speaking of J.J. and his gang, they to were supposed to have buried a cache near a bridge just on the outskirts of Pearlington, just in case you go looking. Here’s one that will delight and annoy you all at the same time. Jerome Bonapart had a “war chest” containing $80,000.00 in French gold coins that he brought to what is now Hancock County, Mississippi in 1817. The chest of gold coins was to be used to free his brother, you know, the famous one, Napoleon. The chest and its contents were buried about 100 feet east of the Pearl River where Jerome and his group were camped. This camping spot was the original location of the Napoleon Church, which has since been moved. Jerome and his group eventually returned to France without digging up the gold. Why they would do such I thing I’m not sure but hey, I’m just telling the story here. Now for the part that will annoy you, the U.S. Government bought the property where the Napoleon Church originally stood and moved the church. So there it is, a chance at recovering some Frenchy loot and the government has put the skids on it by owning the land. Good ol' Uncle Sam, always helping out! I’ll take this opportunity to point out the obvious, there have been a couple of devastating hurricanes in this area over the last few decades so finding clues to these treasures may be very difficult. It’s also very possible that anything buried in a wooden barrel or chest is no longer IN the container because the wood probably wouldn’t exist today. This would be a good test of a metal detector if you like wondering around swamps fighting off the bugs and whatever else might try to sneak up on you. There have been books and books written about treasure signs and how to “read” them. The problem with the majority of these books is that they say a specific sign means the same specific thing at all sites. When dealing with the Spanish there are some symbols that do mean the same things at every site but for the purpose of this article I am going to deal with those that don’t. There will be plenty of symbols that will require you to determine what each sign means individually, based on where it’s located and what else is around or with it. Also for the purpose of this article I will refer to everything as a marker, which would include what most people might call a monument. One of the biggest things that you need to remember when dealing with any treasure sign, and by sign I am referring to a carved symbol or a monument/marker, is that you are not reading the sign, you are INTERPRETING the sign. This is why so many treasures are still out there for us adventurous types to look for and hopefully find. Interpretation leaves a lot of room for mistakes because most of us will interpret things a little differently, just ask a lawyer. Well, maybe not a lawyer, they would probably want to charge you for their opinion of an interpretation. When you are looking at a Spanish marker you need to know that they intended to give themselves the information they needed to move from that marker to the next point along the trail. A marker can contain only one piece of information or it can have two or more pieces, depending on what they needed to say at that point. The Spanish were very fond of using animals and birds as pointers but they also used things such as sun and moon symbols, shadow signs, boots and hats just to mention a few. Each of these are as important as the other and exactly what they are telling you will depend on the terrain around them and how elaborate the marker is. We all know that if you find a turtle on a Spanish trail then you are definitely dealing with a treasure trail. Turtles are always treasure symbols. They won’t take you to a mine or a camp, only treasure. Remember, we are only talking about the Spanish right now. Interpreting Spanish markers can sometimes be an art in itself but most of the time the information is obvious as long as you break it down to it’s simplest form. That’s the key, “it’s simplest form”. Let’s say you find an animal head in a gully. The head is leaning back a little so it is pointed up the gully. The simple interpretation is to go up the gully. Now, let’s add one eye to the animal head, let’s say on the right side of it’s face. Now you have two possibilities with this same monument. The first interpretation would be to look where the eye is looking. Depending on how the eye is made, this can be pretty subjective. If the eye is a drill hole then it is easy to determine an exact direction. If the eye is just a depression or bowl then it’s possible you don’t want to go in the direction the eye is looking but instead, you want to go in the direction the head is facing and since the eye is on the right side of the face you want to be looking on the right side of the gully. If there were two eyes on the head/face then this interpretation would be different. When interpreting signs you have to look at the sign as a verb or action word for lack of a better description. For the most part a marker is telling you what action you need to take, such as look over there or go up there or keep going straight, etc. To be effective in your interpretation you have to break the marker down into its basic parts and then see what each part is telling you. In the example we had an animal head, the animal head was pointing up hill and the animal head had one eye and the eye was on the right side of the head/face. Broken down into its parts it gives you the information of go this way, uphill and look on the right side. This gives you three critical pieces of information to follow the trail but it was all done with one simple marker that most people that aren’t treasure hunters would not even notice. The worst thing you can do when looking for signs is to see something that isn’t really there. If you find something you think is a sign you have to be logical about how you got to the sign itself and does it take you to another sign. Can you backtrack from this sign and find something else that logically takes you to it. You are working a treasure trail, there has to be a trail to follow. If you imagine that things are clues then you will be looking for imaginary treasure. I have run into more than one person that sees things that just aren’t there because they aren’t paying attention to the actual trail, they are just looking for things to be a sign. I know this information is pretty basic but within the constraints of the size of the blog I am trying to keep it short. As the blog progresses I will try to show photos of different Spanish markers and describe how they were interpreted and what they lead to.